The Clinton St. Baking Company is one of the hottest brunch spots in a city obsessed with brunch. A tiny thirty-two-seat eatery on Manhattan's trendy Lower East Side, the restaurant draws long lines of customers who come from far and wide to sample fresh-baked goods, hearty omelets, sugar-cured bacon, and light-as-air pancakes with maple butter. 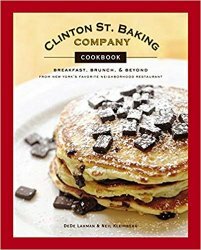 In the Clinton St. Baking Company Cookbook, owners DeDe Lahman and Neil Kleinberg share more than 100 treasured recipes that have made their restaurant a sensation. Learn the secret to their house-made buttermilk biscuits and tomato jam, irresistible muffins and scones, delicious soups and sandwiches, and their decadent, eye-catching desserts. Helpful techniques, like Neil's patented omelet "flip and tuck," and gorgeous color photographs throughout will have readers cooking like pros in no time, and sharing the delicious results.